The Roll Up Shooter's Mat from Voodoo Tactical is a compact, convenient option for the long-range shooter who prefers to travel light. 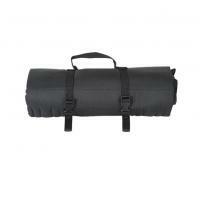 The adjustable quick-release straps make the mat exceptionally portable and allow for rapid deployment when needed. The added feature of extra male end "E" buckles, allow the mat to attach securely to a larger pack. When unrolled, it includes fold-out padded elbow wings for increased comfort during prone-firing, even on rough terrain. The design features a sewn-in data book pocket with pen holder, removable ammunition and tool pouches and quick-access bullet slots.